IMAS researcher Dr Sarah Ugalde has won the Vice Chancellor’s Award in a national competition for early career researchers run by Universities Australia through Thinkable. The Pitch It Clever competition gave scientists the opportunity to explain their research in a short video, with the winners announced during the Universities Australia Higher Education Conference in Canberra. 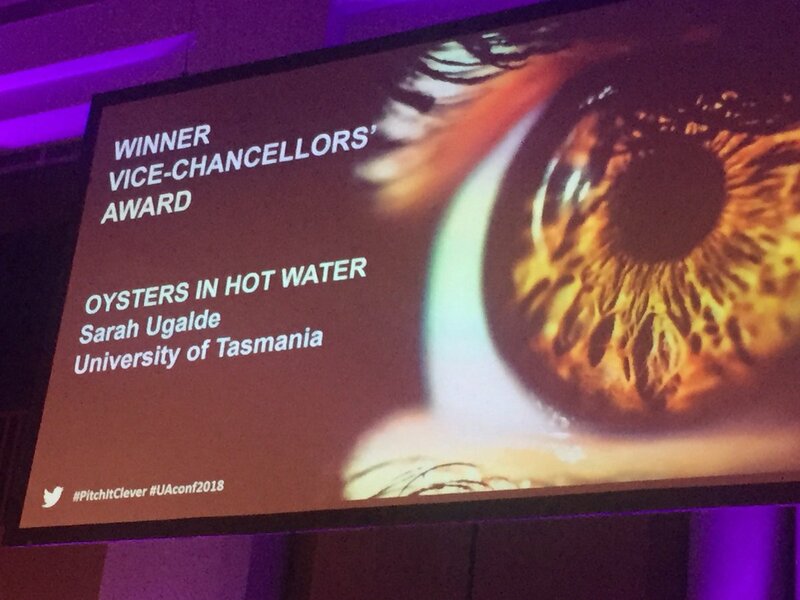 Along with her IMAS colleagues, Tasmanian oyster farmers and Tasmanian Government, Dr Ugalde is doing vital work to help tackle the Pacific Oyster Mortality Syndrome (POMS). Dr Ugalde (Pictured, left) said she hoped her winning entry to the competition would help to raise awareness of the impact of POMS on the oyster industry. “I am extremely honoured to receive such an important award which supports the communication of critical research,” Dr Ugalde said. “I’d like to thank my colleagues in the POMS research and the oyster farmers who are working with us to find solutions to the disease during what are very challenging and difficult times for them. Funded by the Australian Government through the Cooperative Research Centre CRC-P Future Oysters, the IMAS research into POMS began after the disease was first detected in Tasmania in January 2016. Prior to the outbreak Tasmanian oyster farms produced around four million dozen oysters per year with an estimated farm gate value of around $24 million, and Tasmanian hatcheries were supplying approximately 90% of the oyster spat grown on farms in Australia. This summer Dr Ugalde and her IMAS colleagues Dr Christine Crawford and Lewis Christensen worked with oyster farmers on a number of research projects aimed at improving understanding of the disease and developing the most effective responses to it. Dr Ugalde’s winning entry, which was produced with support from the Fisheries Research and Development Corporation and Millstream Productions, can be watched here.